Here I would like to attempt to put together a picture of what we currently know about the Sewol disaster based on current media accounts and make some tentative comments about the possible cause of the incident. In later blogs we will explore the implications of this incident on passenger safety. The Sewol was built by Hayashikane Shipbuilding & Engineering in Nagasaki, Japan in 1994. The Sewol is a Ro-Ro ferry. She has passenger accommodation on the upper decks and a car deck lower down on the vessel. The vessel has a vehicle ramp in the aft of the vessel. The vessel can also carry shipping containers. Vessel was bought by South Korea in October 2012. The Sewoll was modified from Oct 2012 to Feb 2013. It is reported that additional accommodation space was added to the third, fourth and fifth decks to accommodate 181 additional passengers (some reports say 117 passengers and some reports also say additional cargo capacity) and that the existing cabin spaces were also modified. It is reported that the modifications added 239 tons of weight to the vessel (some reports suggest 169 tonnes). The Sewol is reported to have passed all required certification and safety checks following modification. 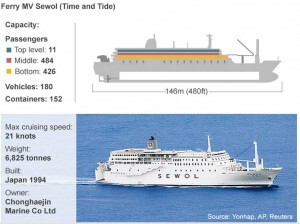 At the time of her last sailing, the Sewol was 146m long, 22m wide with a gross tonnage of 7000 tons. It could accommodate 921 passengers, 35 crew and space for 220 vehicles. It could also carry 152 20 foot shipping containers. It had a reported maximum speed of 21 knots. The vessel is reported to have 46 lifeboats, but this probably means 46 liferafts. From the available photographs it is not clear if there are any davet lunched lifeboats. On its final voyage it is reported that it was carrying more than 100 cars and lorries, along with a sizable shipment of cargo containers strapped onto the deck. Detailed plans of the vessel, showing the layout of the interior and the location of the assembly errors are not available. Reports of the total number of people on board during her final sailing varies from 359 up to 476. The lower estimate is made up of: 30 crew, 325 students, 15 teachers and 89 other passengers. However, at the time of writing it is not known precisely how many people were on board. Most accounts agree on the number of students at 325. She was on a routine voyage which she usually undertakes two or three times per week. The route runs from Incheon to the tourist island of Jeju. The voyage is reported to last 13.5 hours (some reports say 14 hours). On its last voyage, the Sewol sets sail from Incheon on Tuesday 15 April at night. The conditions are reported as calm with a water temperature of about 12OC at the time of the incident. It is expected that the passengers do not undertake an assembly drill prior to departure as the voyage is under 24 hours in duration. Thus by IMO regulations the shipping company is not required to hold an assembly drill. It is alleged that the Captain (68 year old Lee Joon-Seok) was not on the bridge at the time of the incident. This in itself is not an issue as the Captain cannot be expected to be on the bridge at all times. However, the question is whether or not this was a time requiring the Captain to be pilot the vessel. It is alleged that the third mate, a 26 year old woman with one year’s experience at the helm of a vessel and five months experience on the Sewol is at the helm. It is alleged that this was the first time she had the helm of the Sewol. It is alleged that the vessel made a sharp turn between 08:48 and 08:49. It is not clear why the sharp turn was made. Passengers report hearing a bang and feeling a sever jolt. 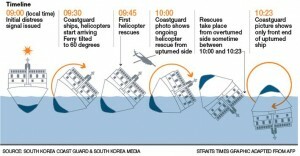 A distress call is made from the Sewol at 08:56 (23:56 GMT) on Wednesday 16 April, vessel begins to heel over. At around 09:30 the Sewol is at 600 heel and helicopters begin arriving. At around 09:45 helicopters begin rescue operations. At around 10:00 vessel is at 90O heel rescue operations continue. At around 10:23 vessel is completely overturned. During this period passengers report that they were instructed to remain where they were. At the time of writing it is alleged that 46 people are confirmed dead, 174 rescued and 256 are missing. Of the suggested 29 crew members on board, 20 including the Captain survived. It is alleged that the Captain was amongst the first to board rescue boats. Note that this does not mean that he was amongst the first rescued as helicopters allegedly rescued the first people. 1) The vessel hits an obstruction on the sea bed ripping open a hole in the vessel which suddenly takes on water causing the severe heel. The bang heard by the passengers was the sound of the vessel hitting the obstruction. As this is a regular voyage on a regular route it is unlikely that the vessel would hit an obstruction on the sea bed unless the vessel was off course at the time of the incident. The rescue divers may be able to eliminate option 1 if they are able to examine the hull of the submerged vessel. 3) The sudden turn made by the vessel causes the vessel to lean into the turn destabilising the cargo and vehicles on the car deck which in turn accentuates the heel. The bang heard by the passengers is the shifting cargo on the vessel. This may be an issue if the modifications to the vessel made the vessel less stable at normal operating situations by raising the centre of gravity of the vessel. Alternatively, the cargo may have been incorrectly secured to the deck so that a sudden turn could have dislodged the cargo. This entry was posted in Evacaution, Ship Evacuation and tagged evacuation, rescue, sea, Sewol, ship evacuation. Bookmark the permalink.